Nestled on the Spectacular Kona Coast at Ocean’s Edge, the Magnificent Villas at Kanaloa Awaits the Discerning Traveler Accustomed to the Best. The Surroundings are Truly World-Class, and the Scenery is Breathtaking! 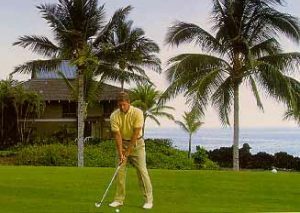 Enjoy the Big Island and all it has to offer From the Spaciousness of your Own Vacation Condo . . . Showcasing Sensations Oceanviews & Breathtaking Sunsets . . . While Listening to the Sound of the Surf Right Outside your Door! You’ll Lounge in Comfort & Style from your Elegantly Appointed Vacation Villa Appointed in an Island-Rattan Motif . . . While Savoring the Spectacular Oceanviews from the Privacy of your Double Sized Tiled Lanai. 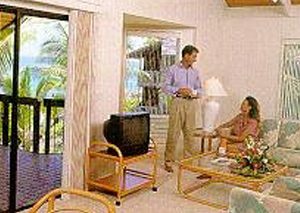 Complete with Native Hawaiian Wood Accents, Additional Features of your Big Island Tropical Paradise Vacation Getaway Features Fully-Equipped Kitchens, Jacuzzi Spas (most units), In-Suite Washer/Dryers, Wet Bars, Walk-In Closets and Color Cable TV’s with VCR’s. 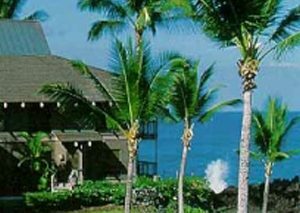 our Big Island Vacation Condo Rental Features a Stunning Oceanfront Setting . . . Reflecting the Charm & Atmosphere of an Enchanting Hawaiian Village. Framed by Swaying Coco Palms and Tropically Manicured Grounds – And Bordered by 36 Holes of Championship Golf – Take a Refreshing Dip in one our Three Pools. then Relax in our Jacuzzi Spas. For the Sports Enthusiast, Enjoy On-Site Championship Golf with Preferred Guest Rates, and Superb Tennis on our Lighted Courts. At Day’s End, Prepare your own ‘fresh catch’ on our Gas BBQ’s or Dine on-Site at our Oceanfront Restaurant. Our Concierge & Activities Desk will Assist you with all your travel Needs. Additiona1 Restaurants and Shops are Just Moments Away. Welcome to the Ideal Big Island Vacation Condo Getaway . . . Set on the Spectacular Kona Coast with Breathtaking Oceanviews & Swaying Coco Palms . . . While listening to the Sound of the Surf Right Outside your Door . . . at the Stunning Villas at Kanaloa. 1- Bedroom Villas: Feature King or Queen Bedding, and Queen Sofa Sleepers; Accommodates 4 guests. 2-Bedroom Villas: Feature King Bedding in the Master Suite, Twins in the 2nd Bedroom (most units) & Queen Sofa Sleepers: Comfortably Sleeps 6 people. 2-Bedroom + Loft Villa Suites: Feature King Bedding in Master; Twins in the Second Bedroom & Loft (most units); and Queen Sofa Sleeper; Accommodates up to 8 guests.